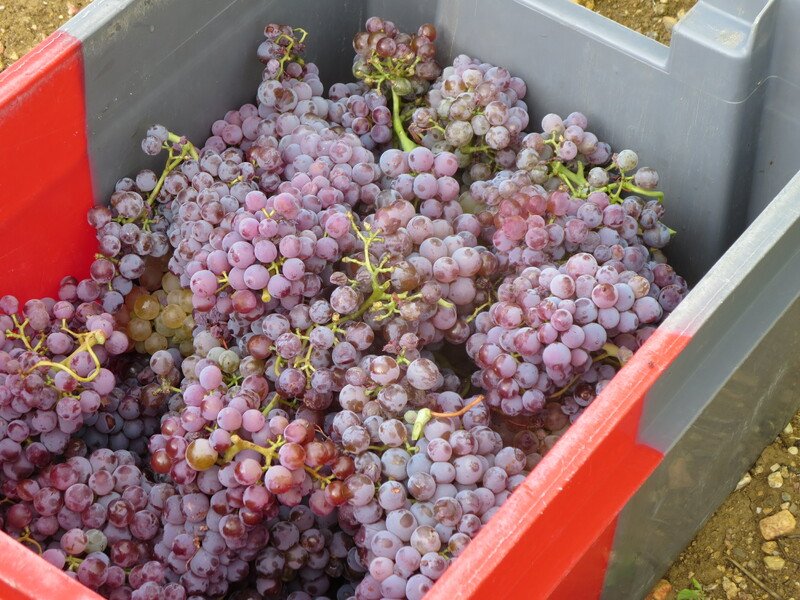 September 3rd began with further picking at the southern quarter of the vineyards of Mas Coutelou, Peilhan and Font D’Oulette, followed by an afternoon of picking in the northern end in Segrairals. 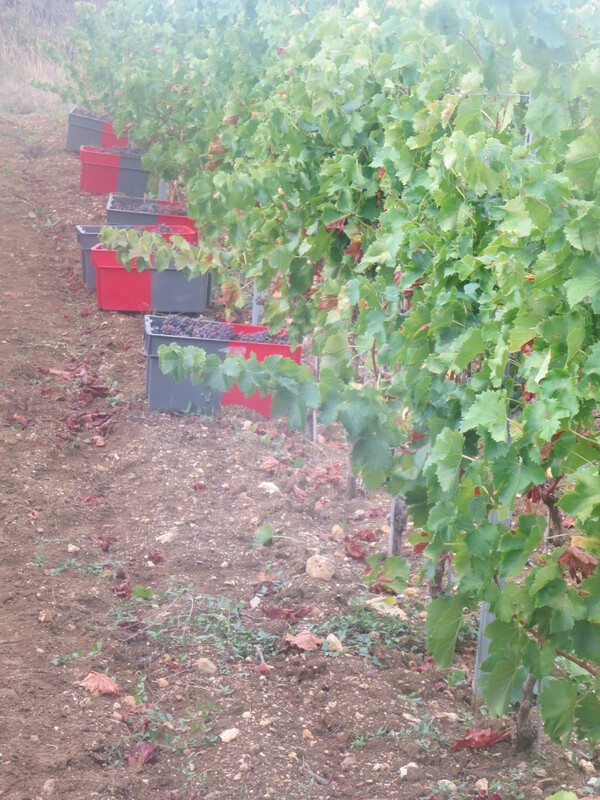 Peilhan and Font D’Oulette are both complanted, ie they have lots of different grape varieties being grown and often in the same rows. 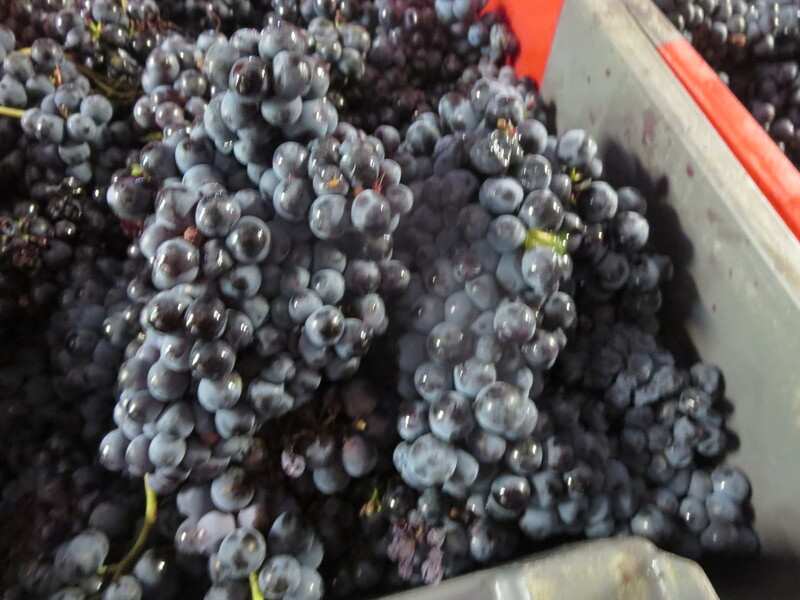 However it was the Grenache Gris in Peilhan which was being picked first to provide the juice for a rosé wine. Grenache Gris is, in my opinion, one of the most interesting cépages in the Languedoc Roussillon providing many of its best white wines. 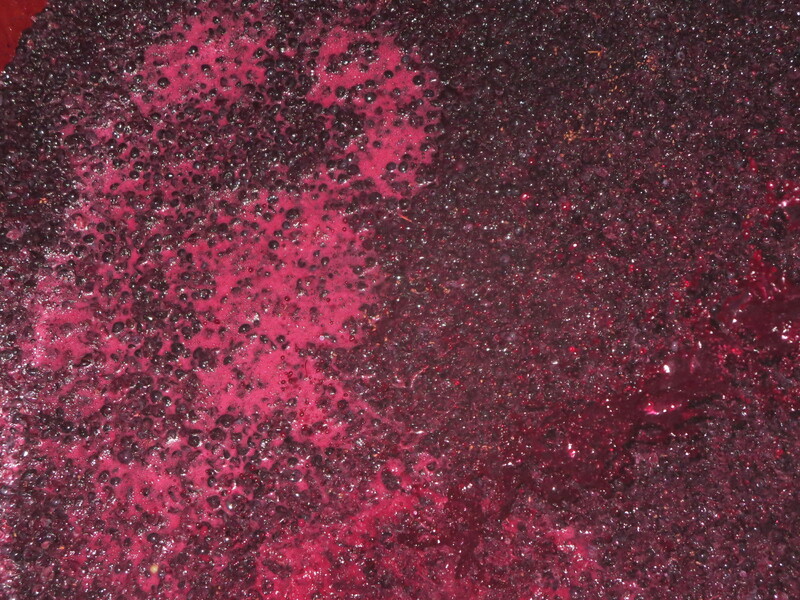 It also has a grey, pink skin which can provide a little colour to the wine if the juice is allowed to stay in contact with those skins for a few hours. In this case it would provide a very pale rosé wine, I heard the style described recently as a gris de gris. 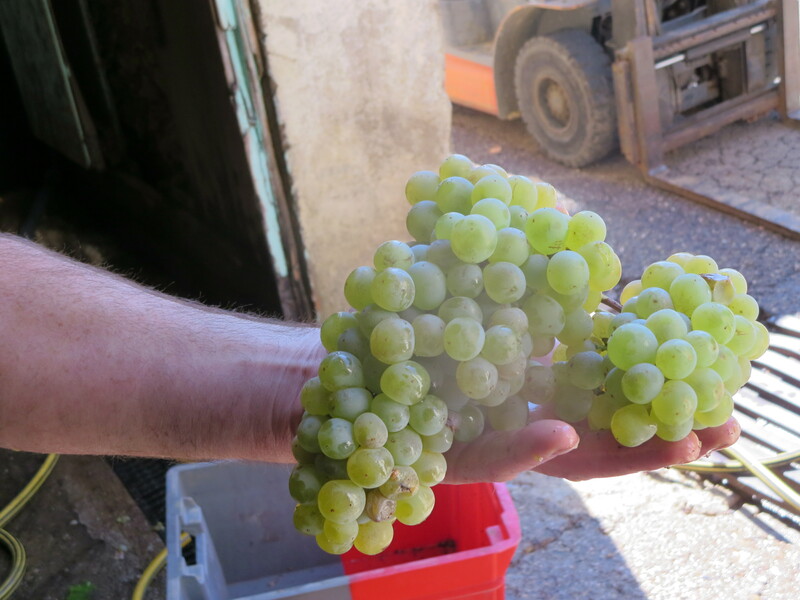 How this turns out we shall see, it could yet make a white wine. 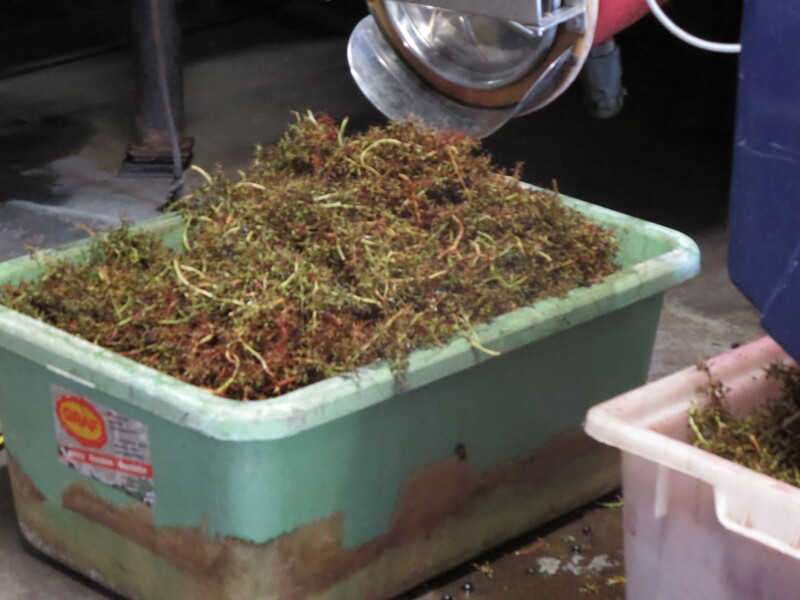 When the Grenache Gris was through the press it was time to bring in the grapes from Font D’Oulette. 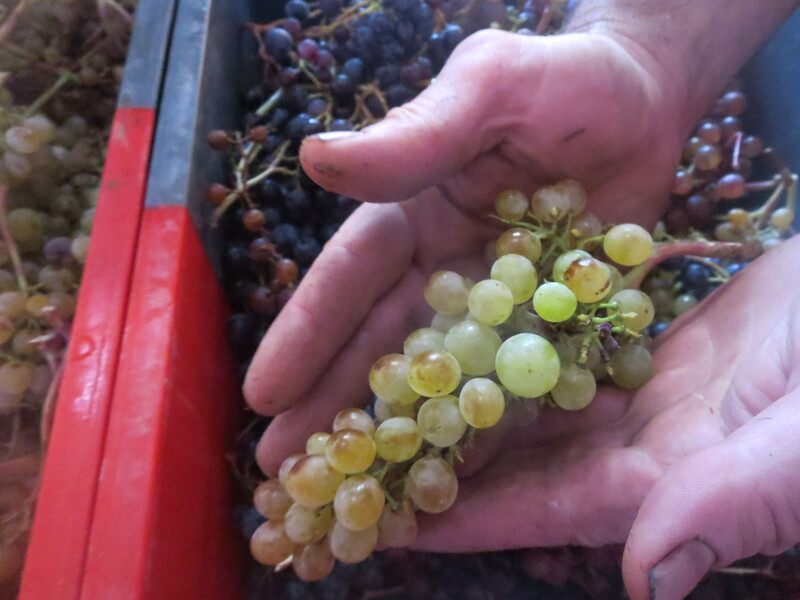 This has a whole variety of cépages from the traditional Aramon Noir to the more unusual Oeillade Muscat, Clairette Blanche and Aramon Gris along with many others. 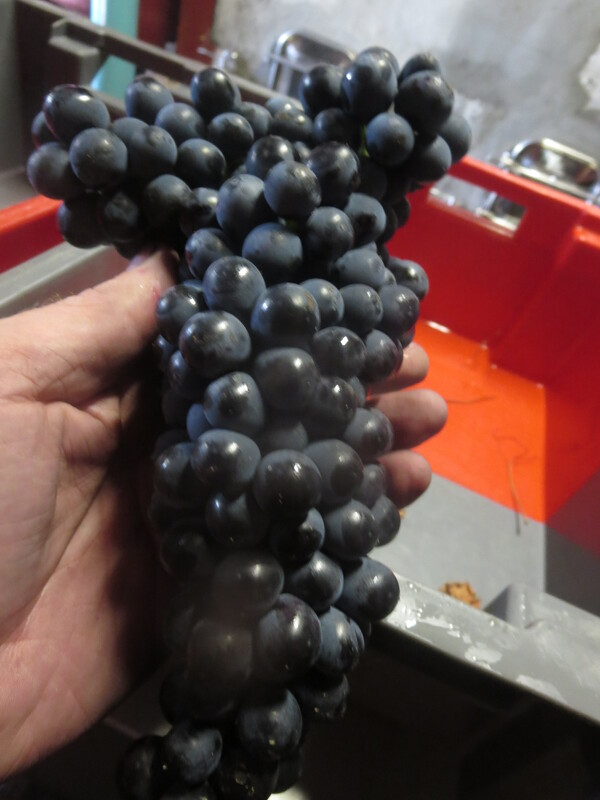 This assemblage will be added to some Cinsault (perhaps from Rome vineyard, perhaps not) to make Flower Power which was made for the first time in 2014 and has proved to be a big success. Indeed we shared a magnum on Friday at lunch and it was excellent, starting to really open up. 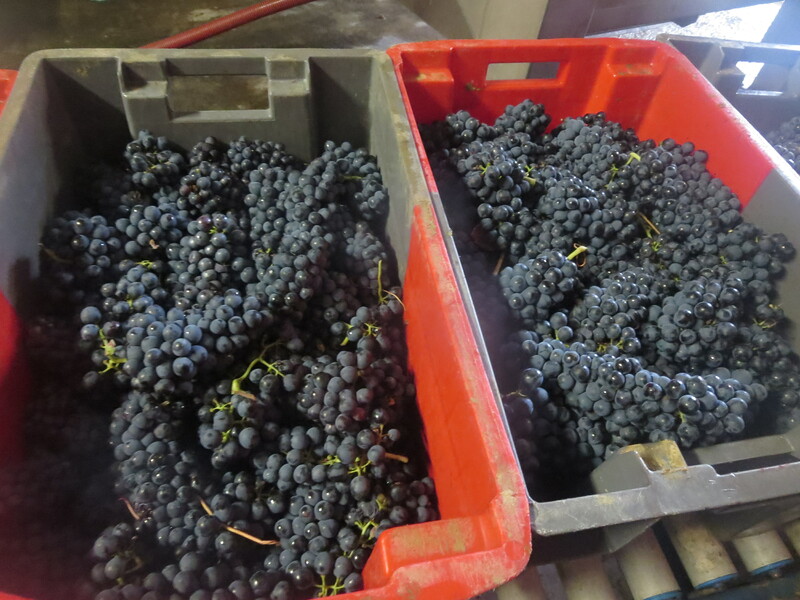 Then onto Syrah, some lovely bunches from Segriarals and Caraillet, the biggest of the Coutelou vineyards. 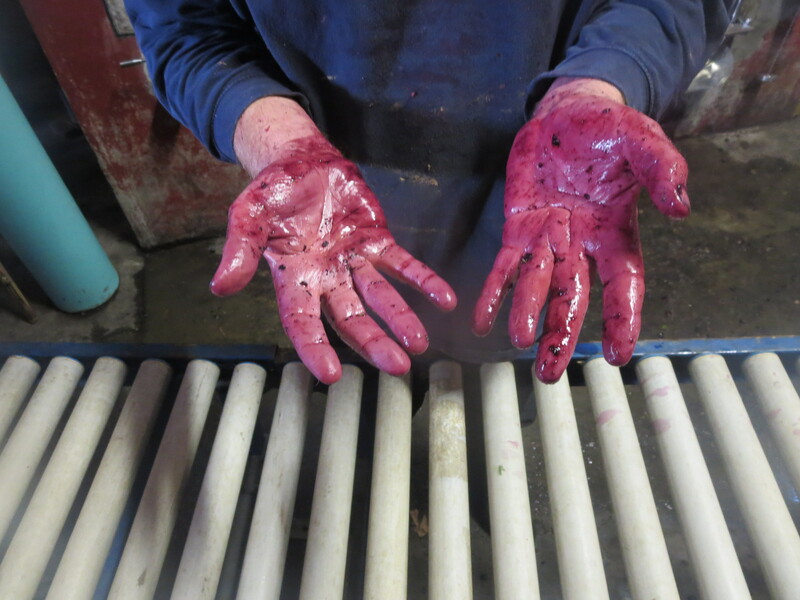 The rich juice provided plenty of colour as you might see! This was a long day, we finished around 7.15 pm, the day starts at 7.30am. I slept well that night. 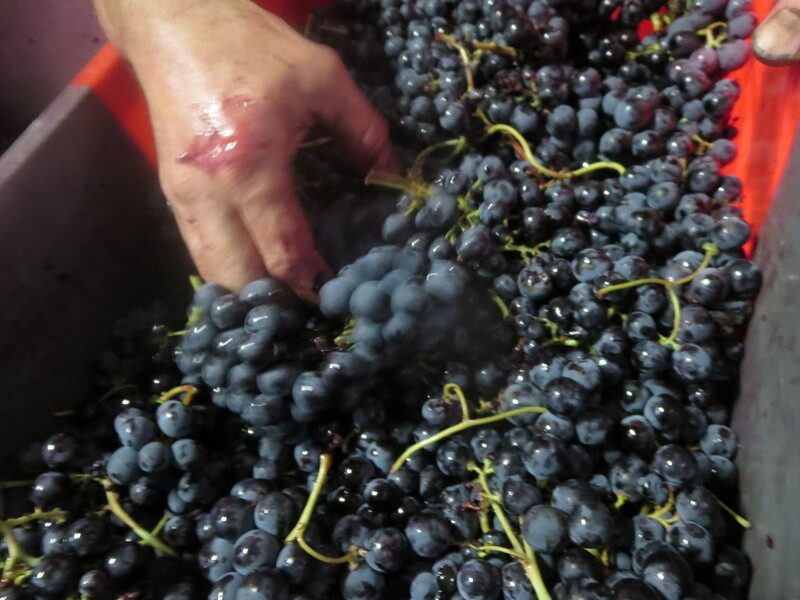 September 4th brought a whole day of Syrah grapes from Segrairals and Caraillet again. 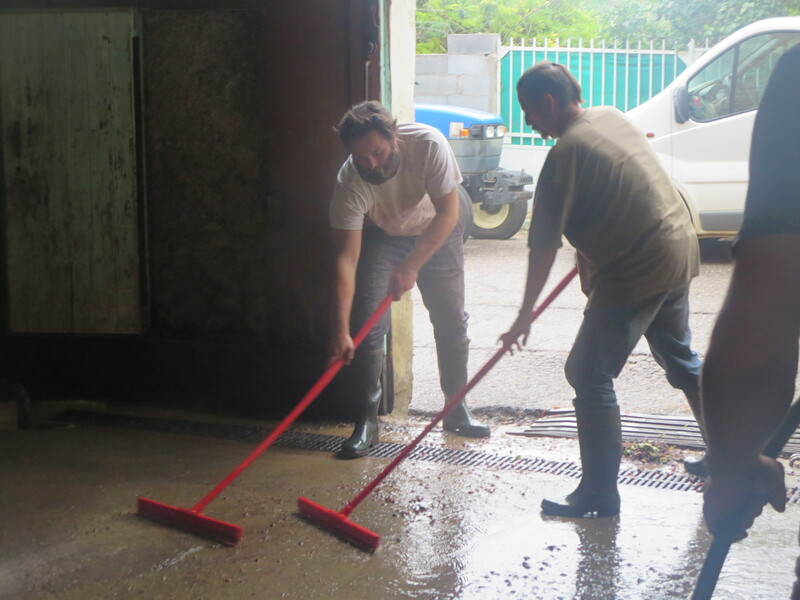 It was also the last day we had the superb Carole with us for the harvest as she heads to Champagne for picking there. Carole is a true expert in all aspects of the vineyard and cellar and she is always willing to teach and to share, she will be a big miss. 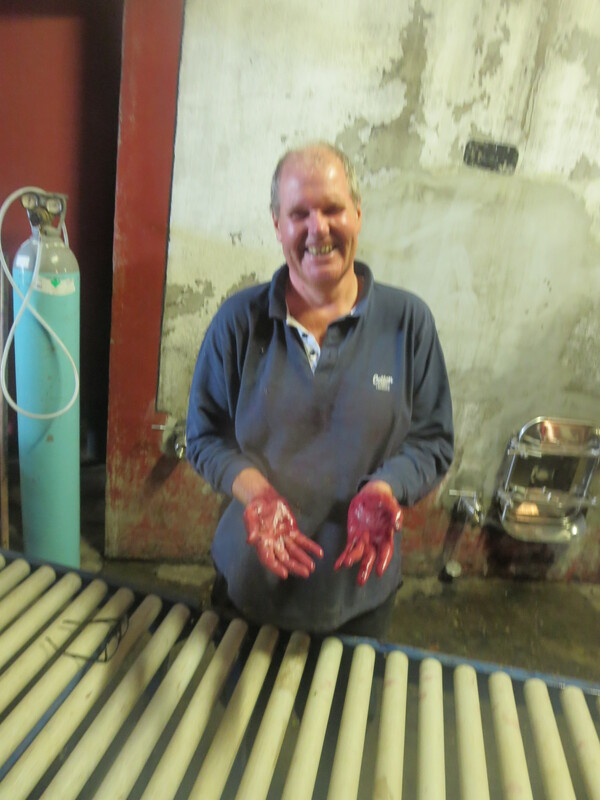 Whilst we worked on the sorting of the Syrah Jeff and Cameron set about testing and remontage (pumping over the grapes already in the tanks). We also tasted samples from the various tanks. 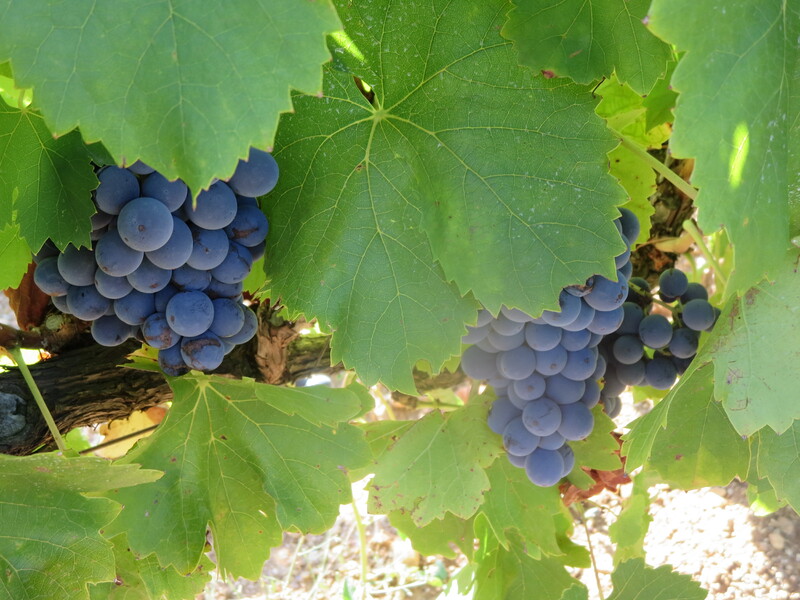 The Syrah shows real fruit and is already developing different characteristics. Segrairals was gaining weight and power, Sainte Suzanne much more floral and elegant. 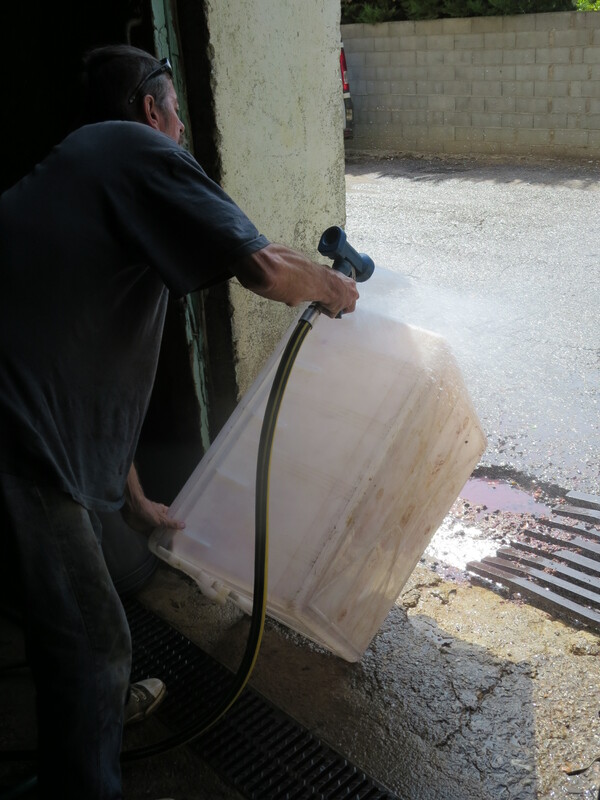 The white juice from the complanted Peilhan, still in contact with skins, is beginning to ferment quickly as the yeasts get to work, perhaps because the yeasts are on those skins. 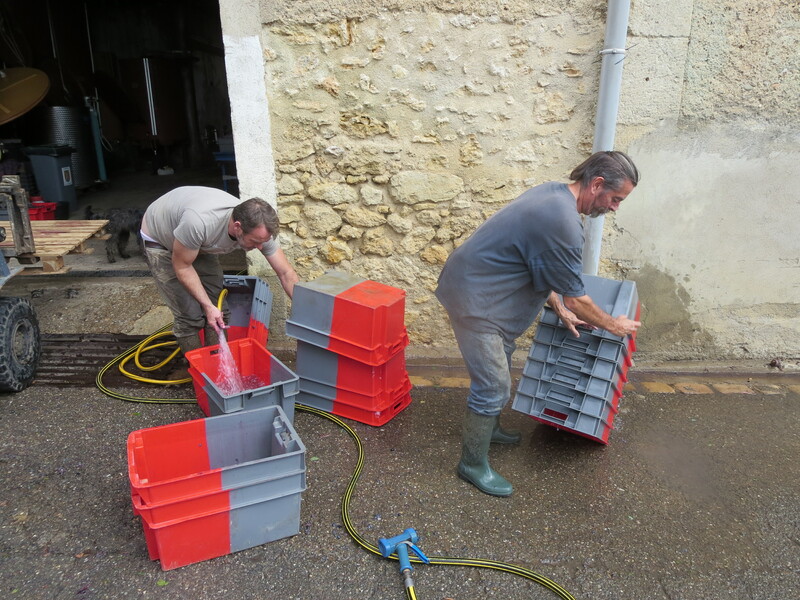 It is a treat to watch the development of these wines from infancy as they take their first steps towards the final wine. We finished around 6.15 and then went to Jeff’s for a special treat to send off Carole in some style. Oysters and mussels together with some Chardonnay from the brilliant Spanish domaine, Casa Pardet, lovely. Even the sky responded. 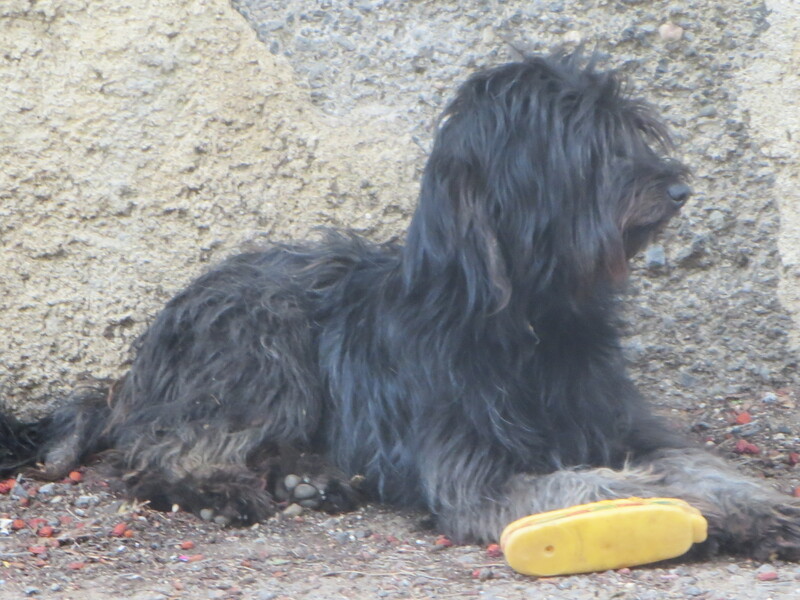 Meanwhile Icare fans, your hero was guarding his favourite toy, a plastic, squeaky sandwich. And sleeping, it is fun to watch him as he dreams because his tail wags furiously. 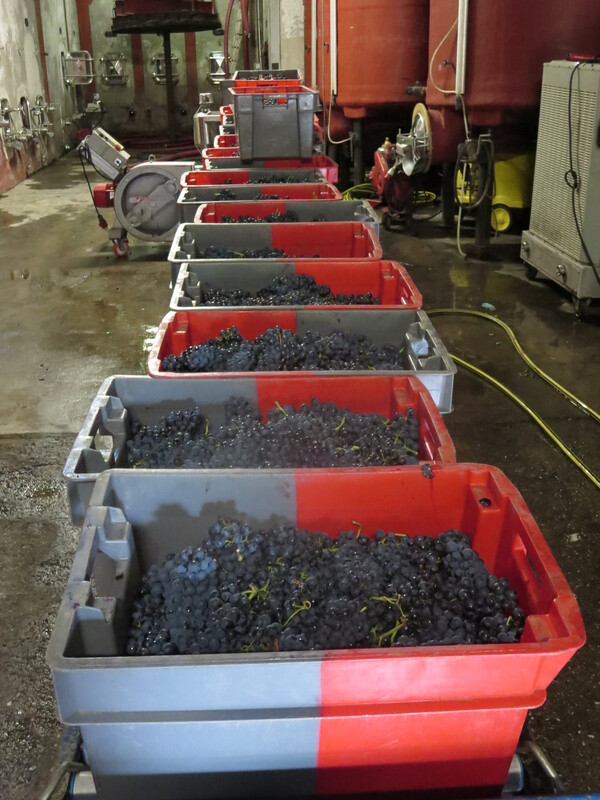 Saturday September 5th was a day off for me but not for the rest as they continued to process the Syrah form Segrairals, I did say it is a big parcel. 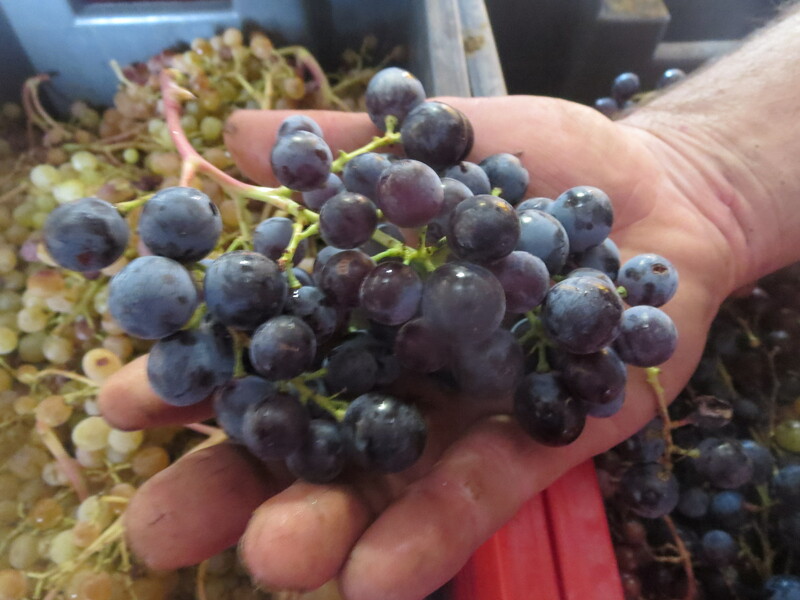 The Grenache and Cinsault are still not quite ready and they will dictate when the team can start to harvest them but that will not be before Tuesday. 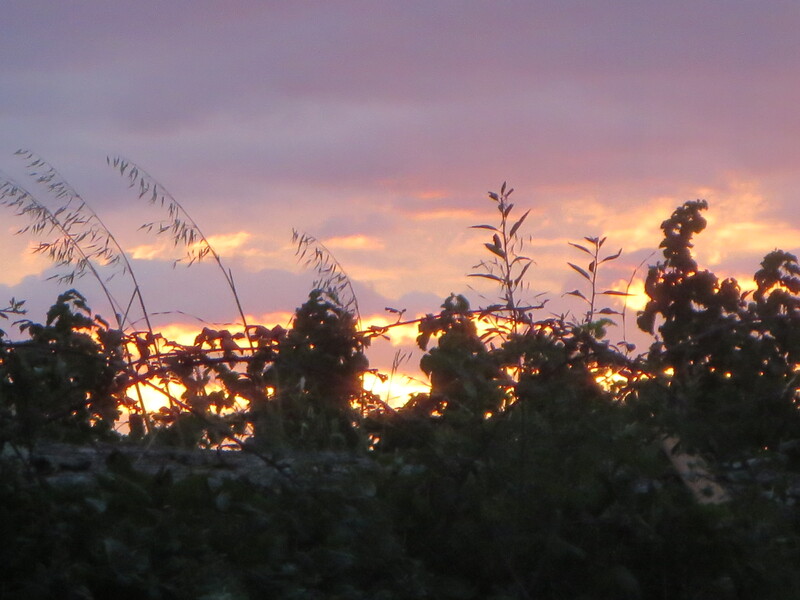 The weather forecast is good for next week so conditions should be right. I did call round however and the work had certainly been going on as you can see from the bacs of the stalks (rafle) . I did manage to sneak into lunch however. 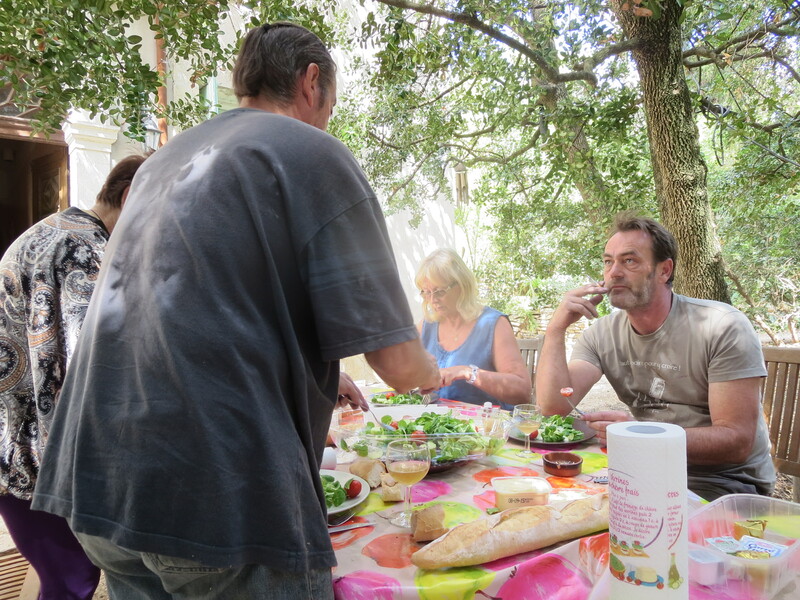 These are a highlight of the harvest season, with food prepared by Marie France from Puimisson and bottles opened including a terrific bottle of Castets, that rare grape I have described before. We sit at a big table int he garden of Jeff’s father, right next to the cellar. 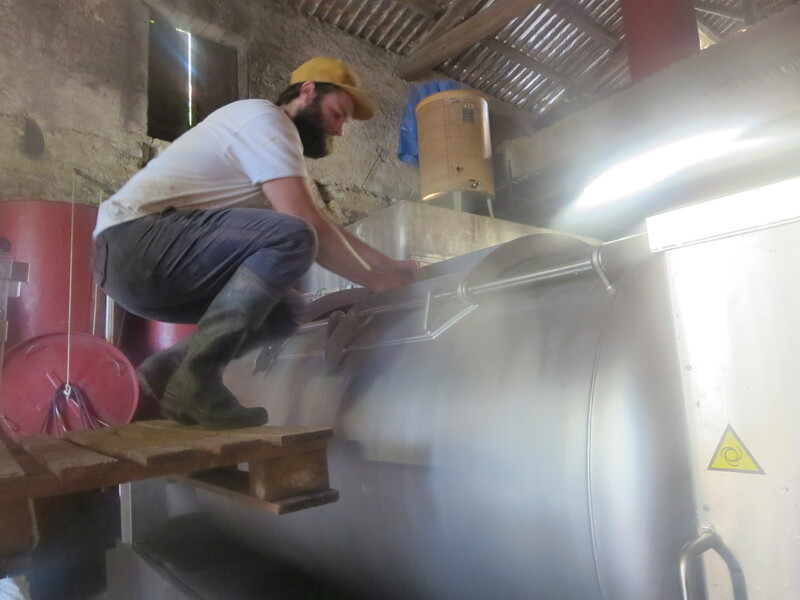 Sunday will be a day of rest except for Jeff and Cameron who will do a round of the tanks to check on their progress and carry out more remontage. 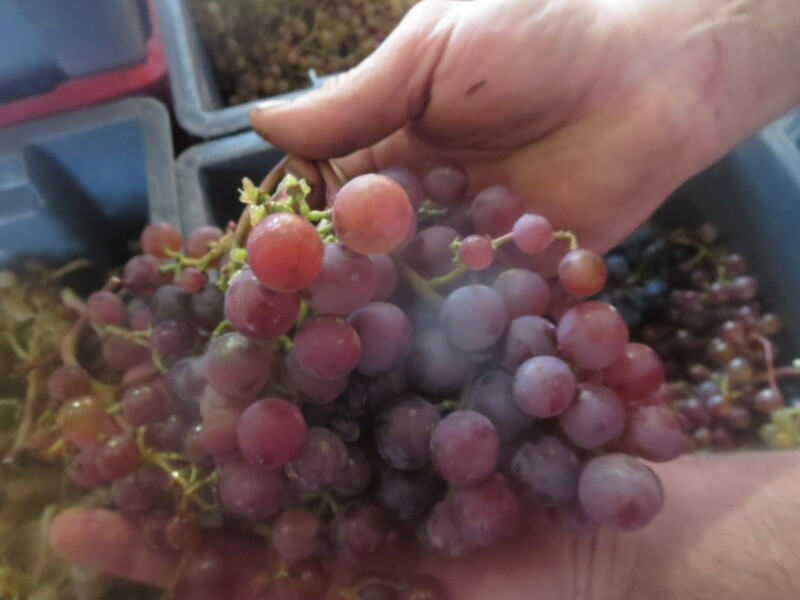 There is already a lot for Jeff to be thinking about, which wines are where, how are they progressing, have the remontages been done, are the analyses done. 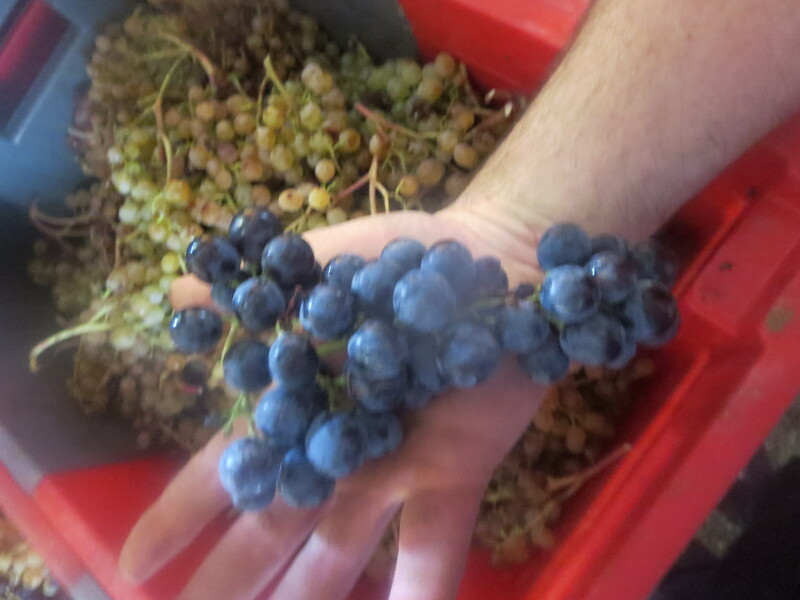 Plus all the options about which grapes to blend, what cuvées to make and, for example, whether the Grenache Gris will be white or rosé. 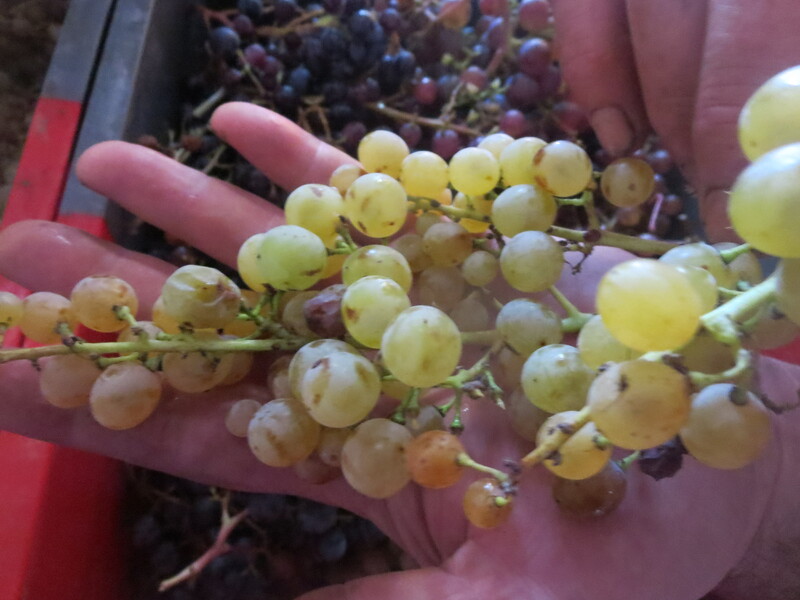 Then off to the vineyards to check on the grapes and their readiness for harvest. 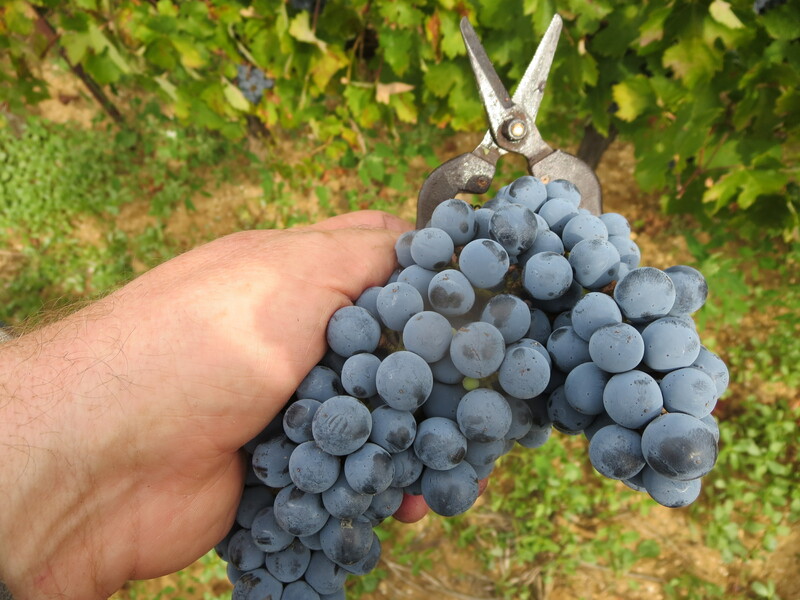 Pressure, worries, and hard work – spare a thought for the vigneron. 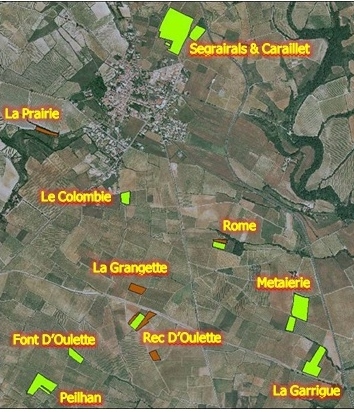 Categories: Vignerons, Vines, Wines | Tags: Aramon Gris, Aramon Noir, Castets, Cinsault, Clairette Blanche, Clairette Musquée, Flower Power, Font D'Oulette, Grenache Gris, Oeillade. 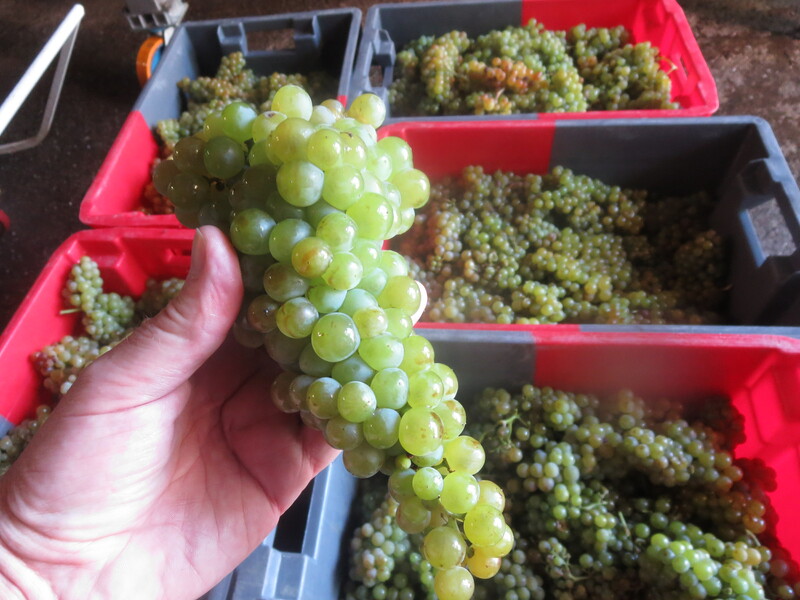 Oeillade Muscat, Peilhan, remontage, Sainte Suzanne, Segrairals | Permalink.